Surrounded by his loving family, Cal passed peacefully on November 12, 2018. He leaves behind his beloved wife Carole, son’s Ken (Shelly), Terry (Carla) and Tom (Rose), 10 cherished grandchildren and 4 wonderful great-grandchildren. Step-brother to Jan Prochak (Roger) and a very special brother in-law to Janice Moore (Garry). A Masonic service will be held at the West Chapel of Hulse, Playfair & McGarry , 150 Woodroffe Avenue (at Richmond Road), Ottawa on Saturday, November 24, 2018 at 11:45a.m. followed by a Celebration of Life from 12:00p.m. – 3:00p.m. For those wishing to donate in Cal’s memory, the family kindly request donations to the Queensway Carleton Hospital or the University of Ottawa Heart Institute. We have had message from Cal's son Tom regarding the Masonic Funeral Ceremony for Cal. " This ceremony is open to anyone who wishes to attend. It is mostly the family that shows up....but if friends do want to attend they are more than welcome." "It is with great sadness that I inform you that dad passed away peacefully in the QCH hospital early Monday morning. All of our family was at his bedside proving comfort and support to both dad and mom. At dad’s request, in lieu of a funeral service, a Masonic service will be held on Saturday, November 24th at 11:45amfollowed by a Celebration of Life at 12:00pm – 3:00pm. [ Please note that the Masonic service is for Masonic members only.] As many of you have wide distribution lists, it would be much appreciated if you could spread the word. This is a very difficult time for all of us but with the support of friends and family we will continue to move forward with great memories of dad. I know many of you will want to call mom to express your condolences and best wishes. We would like to ask if possible to give mom a few day to let this sink in before reaching out to her. Thank you again for all of your support that has been offered during our conversations today. It is very much appreciated by our entire family. On the behalf of all the members of the NATO Veterans Organization of Canada (NVOC) I offer the condolences of us all to the family. Cal was one of the "Originals" and was a key leader and builder of our own veterans advocacy organization. His energies were acknowledged by all that he supported. The Masons, the Royal Canadian Legion and our own organization - as well as others. He was in the midst of preparing and submitting honours and awards for NVOC and had close links within Rideau Hall and the Chancellery (one of our Directors will assume the task of completing what Cal has started). The National NVOC project close and dear to Cal was the approval of a NVOC official "Flag" for use in ceremonies. He spearheaded a successful fund raising effort with our members. We are well along in the Flag Project –. I will be asking one of the Directors of the Board to take on a leadership role for this project. I do feel that we have an obligation to bring the project to fruition as a tribute to Cal. He wanted this to happen. We have all lost a friend, a brother veteran and a community leader. At a recent meeting of the NATO Veterans Organization of Canada (NVOC) we were informed about changes to the coverage Hearing-loss and directed to the Sep 18 issue of Legion Magazine which includes an editorial and an article that raised the profile of these changes. I have put this email together to provide easy access to the information. Feel free to pass this along to anyone you believe may be interested. The board of directors thank the 73 members who donated a total of $3930.00 to the flag project. The heraldry process is well under way and the design phase is next. Branch 95 of the Royal Canadian Legion invites you to a dedication ceremony for their LAV III Afghan Memorial. For details please see the attached invitation. We are sorry to inform you of the passing of Vern Williamson. Many will remember Vern as a regular attendee at our meetings and as a Past President of The Ottawa/Gatineau Unit. The link below provides details regarding visitation and funeral arrangements. Services available to Veterans through VAC if they qualify for Veterans Independence Program (VIP) and have a need. Ambulatory Health Care for services such as health assessments, diagnostic services, and social and recreational activities (e.g. adult day care) as well as transportation to receive the service. Transportation Services to help support your independence and your participation in social activities if you are at risk of social isolation and have financial need. Intermediate Care Services when you need a greater level of nursing or personal assistance. Here's a link to the Health Canada list of recalled drugs and a link to the news item. Congratulations to our Patron, Gen[ret] Paul Manson for this recognition. On June 7, 2018, at the Sunwest Aviation hangar complex at Calgary International Airport, Canada’s Aviation Hall of Fame (CAHF) hosted a gala dinner and its 45th induction, which saw the addition of four new members. They join 228 existing members since awards began in 1973. Also attending the dinner were 12 previous inductees including Max Ward and retired Royal Canadian Air Force (RCAF) Col Bud White, who were both inducted in 1973. This year’s inductees are an eclectic cross-section of Canada’s and diverse unique aviation history. They include a bush pilot entrepreneur, a fighter pilot, a test pilot inventor and a medical doctor. These four inductees epitomize the variety of expertise in the Canadian aviation community. John Bogie moved to Canada in 1947 and joined Laurentian Air Services as a pilot. In 1968, he purchased the company and spent the next four decades expanding its capabilities in both charter and resource exploration. He also purchased 64 surplus de Havilland Canada DH-C2 Beaver aircraft from the United States Army, shipped them to Canada, had them refurbished, and chartered or sold them to other operators. At the same time Bogie was a co-founder of the Canadian Owners and Pilots Association (COPA) where he was instrumental in creating a simplified medical for pilots and aviation liability group insurance for individual pilots and commercial operators. Bogie also helped create the Canadian Business Aircraft Association (CBAA) and the Civil Air Search and Rescue Association (CASARA) a civilian pilot search and rescue organization. Due to his failing health he was inducted into the CAHF in a ceremony in Ottawa on Feb. 10, 2018, and passed away April 5, 2018. Paul Manson joined the RCAF in 1951 to become a fighter pilot. After completing studies at the Royal Military College (RMC), where he had graduated as the top cadet, Manson was posted to Number 3 Flying Training School, Claresholm, Alta., for initial flight training on Harvard aircaft. After graduating, he flew the T-33, F-86 Sabre, CF-100, CF-101, CF-5 and the CF-104, which he describes as his favourite fighter aircraft. Manson was the program manager for the new fighter program (NFP), which was tasked to replace the aging fleet of CF-104 and CF-101 fighters. The decision to purchase the CF-188 Hornet resulted in the purchase of 138 aircraft with deliveries starting in 1982. Manson finished his military career as the Chief of the Defence Staff from 1986 to 1989. After his time in the RCAF, Manson served as president of Paramax, an engineering and software development corporation, and then served as chairman of Lockheed Martin Canada. Manson then took on the volunteer chairmanship of the “Passing the Torch” campaign, raising $16.5 million in support of the new Canadian War Museum. He has served as chairman on many aerospace and military organizations and is a well-known commentator on defence and security issues. Dr. John Maris started his Canadian aviation career serving 12 years in the RCAF as an operational pilot flying as commander of a CP-140. He is a test pilot, certified in Canada, the United States and Europe with a pilot’s licence showing he is certified to fly Boeing 747s and everything else. In 1983 he was a direct entry into the Canadian Forces and at the same time married, and he and his wife formed Marinvent, a private company conducting advanced aerospace research and development. he company has developed and patented several of its own products, including the development and standardization of the software for electronic flight bags; an advanced airflow performance monitor that provides flight crew and avionics systems with real time airfoil performance and flight test standardization courses for the Bombardier C Series; and flight organization systems for NASA. Marinvent’s U.S. JV Advanced Aerospace Solutions, LLC was recognized by NASA with the 2014 Small Business sub contractor of the Year Award. Dr. Dwight Gregory Powell O.C. When Dr. Greg Powell was head of Trauma Services at Foothills Medical Centre in Calgary, he found that half the deaths due to trauma could have been prevented if the patients had quicker access to critical care. Combining his trauma specialties with his aviation interests, in 1985 he founded the not-for-profit organization known as Shock Trauma Air Rescue Service (STARS) in Calgary. Under his leadership, the fleet expanded to northern Alberta, Saskatchewan and Manitoba. As helicopter equipment was improved, safety enhancements were also improved with the addition of wire strike kits, night vision goggles and the development of Transport Canada-certified heliports within their operational areas. STARS also created GPS approaches into many of these heliports. Currently its fleet consists of nine BK 117 helicopters and three larger Leonardo AW139 helicopters operating from six bases in Alberta, Saskatchewan and Manitoba. Powell is also involved in volunteer work in Alberta and has been active in the international evacuation community and served as president of the Association of Air Medical Services based in Washington, D.C.
Calgary Alberta - The McCann Family Foundation and Canadian Legacy Project today announced Homes For Heroes Foundation <http://www.h4hf.ca> , a new registered charity with the goal to end homelessness among Canadian military veterans. homelessness. The foundations mandate is to provide, to those who have served in the Canadian Armed Forces, housing and the framework needed to ensure a successful transition into civilian life. The first Homes For Heroes <http://www.h4hf.ca> is planned for Calgary in the Bridgeland community on land sub-leased from the Canadian Institute for the Blind. The first village will feature 20 tiny homes, a resource centre,community gardens and memorials to Canadian soldiers who lost their lives in Afghanistan. In contrast to traditional homeless services, a tiny home provides our veterans with privacy, security, peer-to-peer support, and the ability to integrate back into society at a comfortable pace. Veteran support services are facilitated through The Mustard Seed <https://theseed.ca/> . Their onsite resource centre will provide our veterans with mentoring, case management, counselling, and linkage to other programs and services. "Homes For Heroes village will be a unique tiny home village that offers a solution to the homeless epidemic facing some our Canadian military veterans. Each home will be named after a Canadian soldier who lost his or her life in Afghanistan. We owe it to our Canadian soldiers to help them through the difficult times they might be encountering and we believe we have a solution to end the homeless issues they are facing." stated David Howard, Co-Founder and President of Homes For Heroes Foundation. despondency to their original vitality and self-dependency gives us great satisfaction. The villages across Canada will allow grateful Canadians to show our veterans the appreciation we feel for their service to our country." Stated McCann. people of ATCO to participate in this critical project to support the brave men and women who have given so much to this country. The sponsorship of our newly designed permanent modular housing and resource centre is a showcase of ATCO's urban design capabilities that will be a 'Home for Heroes'." our country, and we are inspired by this unique way to give back to our veterans." stated Scott MacDonald, CP Senior Vice-President Operations. As of April 1, 2018, medically-releasing Canadian Armed Forces (CAF) members, Veterans who are medically released and their families who are in need of assistance will have access to the Veteran Family Program. The Military Family Resource Centres (MFRC) are a hub for military communities and including Veterans in their programming is a natural extension to the MRFCs’ suite of services. Funded by Veterans Affairs Canada, the Veteran Family Program can assist medically-releasing Canadian Armed Forces (CAF) members, medically-released Veterans and their families with access to transition programs, referral services and intervention support. The Veteran Family Program is a suite of transition support services designed to help CAF members and Veterans transition from military to post-service life by guiding them and their families to information and resources in their communities. We know that when a member of the military serves, their family serves too. That’s why in just a few short weeks, medically-released Veterans and their families will have access to the Veteran Family Program at all 32 Military Family Resource Centres across the country. We are expanding the successful pilot project that ran at 7 MFRCs, like this one here in Edmonton. We heard from Veterans and their families that they really liked being able to come by and get the support they needed, when they needed it. Judgement free. Veterans Affairs Canada is committing $147 million over six years for this expansion. For online information go to www.cafconnection.ca or call the 24/7 Family Information Line (1-800-866-4546). Research has shown that the transition from military to post-service life can be a stressful time. Ensuring uninterrupted access to the Veteran Family Program can help to address some of the challenges faced by medically releasing Canadian Armed Forces members, medically released Veterans and their families. Veterans Affairs Canada implements new and enhanced programs and services for Veterans and their families Six new and two enhanced programs and services announced in Budget 2017 are now available to support Veteran and family well-being April 4, 2018 – Ottawa – Veterans Affairs Canada During military service, Canadian Armed Forces members develop incredible skills and assets from their military training and experience. Following service, transitioning to a post-service life provides opportunities and a new mission for Veterans and their families. That is why the Government of Canada offers a wide range of programs and services that support this transition and target all aspects of a Veteran's well-being. April 1, 2018, marks an important milestone for eight mandate commitments that will improve supports for Veterans and their families. This comprehensive package recognizes the hard work and sacrifices of Veterans through new and enhanced programs and services that provide direct support to caregivers, helps more families, supports mental health and offers greater education and training benefits that Veterans may need in their post-service lives. For many Veterans and their families, a meaningful post-service career is key to their financial security and mental and physical well-being. The new Education and Training Benefit will provide up to $80,000 to help Veterans achieve their educational goals and better position them to be more competitive in the civilian workforce. The enhanced Career Transition Services Program will also help them reach their employment goals by helping them find meaningful careers that best suit their needs and those of their families. Families are an integral part of Veterans’ transition and well-being. Additional support for families now includes: expanded access to the Veteran Family Program; the Caregiver Recognition Benefit which provides an informal caregiver $1,000 a month, tax-free; and the removal of time limits to access Rehabilitation Services and Vocational Assistance which gives survivors, spouses and common-law partners more flexibility to receive assistance when they need it. The Veterans Emergency Fund addresses short-term, emergency financial needs of Veterans and their families. The fund means that front-line offices will be better able to deal with emergency situations more quickly and efficiently, without complicated eligibility requirements and processes. The Government is also establishing a new virtual Centre of Excellence on PTSD and other related mental health conditions to conduct applied research and share knowledge on effective treatments. This will result in better understanding of the mental health issues that affect Veterans and their families, and in finding more effective treatments, supports and self-help tools to combat these conditions. Finally, the new Veteran and Family Well-Being Fund supports research and innovative initiatives and projects tailored to improve the well-being of Veterans and their families. Veterans Affairs Canada will partner with organizations in the public, private and academic sectors. Improvements to well-being can cover a range of activities—from suicide prevention research, to initiatives that help homeless Veterans, to projects that enable Veterans to make smoother transitions to life after service. "The new and enhanced programs and services for Veterans and their families are crucial to their success following military service. Support for Veterans is not a one-size-fits-all solution. Being able to focus on education, career training, family support, research and emergency funding are all important pieces that, when put together, create a comprehensive package the improves the lives of Veterans and their families." "Leaving the Canadian Armed Forces is a major life transition. These new investments make that transition easier for members and their families. The addition of these programs reflects our commitment to care and support for our military members today -- and to attract our future recruits." Veterans and will help ensure that programming continues to meet the increasingly complex and diverse needs of Canada's Veterans and their families. visit a Veterans Affairs Canada office or call 1-866-522-2122 toll-free for information on eligibility and how to apply for these new benefits. for My VAC Account as it helps plan for a smoother transition. The annual Memorial Service for the Seven Paratroopers who lost their lives in the Ottawa River during a training exercise parachute drop on May 8th 1968. 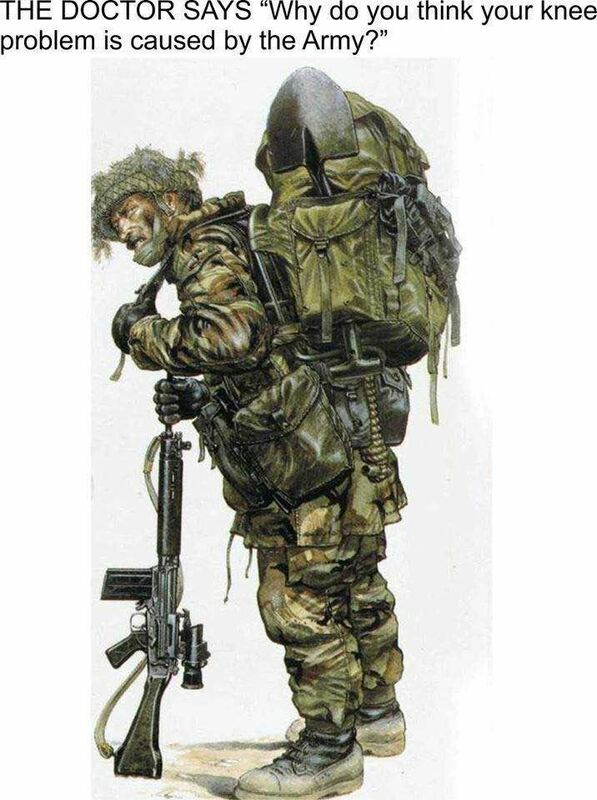 We have received permission from Garrison Petawawa to hold the service that will take place at the Memorial Cairn Wegner Point, Sunday May 13th, 2018, 11:00 am. Please try to arrive early as we are expecting more than in the past years. Please join us for a light lunch afterwards to meet family members, survivors, friends, former military acquaintances and present military personnel. The lunch will be at the WO’s & Sgts mess. It is very important to have the support of all if this Service is to continue. Donations for the luncheon and facility are greatly appreciated, please make cheque payable to Dennis Stow. Please find below links to an advance copy of the Veterans Review and Appeal Board Rules of Practice and Procedure. These proposed rules will be published tomorrow (March 17, 2018) in Part I of the Canada Gazette to give all interested parties 30 days to review and comment. I would like to take this opportunity to present the rules initiative to you and invite your participation in the comment period. As you know, the Board provides Veterans, Canadian Armed Forces (CAF) and RCMP members, and their families, with an independent avenue of appeal for disability benefits decisions. Practices and procedures for delivering our national program of hearings have developed over time. This has been reasonably effective in our context, thanks to ongoing working relationships with the Bureau of Pensions Advocates (a group of lawyers within Veterans Affairs Canada that represents 99 per cent of applicants) and service organizations like the Royal Canadian Legion. We are now publishing proposed rules to further support Veterans and their representatives by explaining our current practices and procedures for hearings. The proposed rules clarify several aspects of the process which will help Veterans prepare for their hearings, avoid delays and obtain the best possible outcome from the Board. What information to submit with an application for a compassionate award. I have also attached a short backgrounder for quick reference. I encourage you to review the attachments and to follow the guidance in the Notice (first page of the rules proposal) for submitting feedback by April 16, 2018. After the comment period is over, the Board will review and consider all comments before finalizing the proposal. Thank you for your continued engagement in the Board’s efforts to provide Veterans and their families with a fair and timely appeal process. This brochure is a resource for Veterans, CAF and RCMP members, and their families who may be interested in applying to the Board for an independent review of a disability benefits decision made by Veterans Affairs Canada. Veterans Review and Appeal Board - Winter Update As we come to the end of 2017 and look forward to the New Year, I would like to update you on some of the key initiatives and news from the Board from the past few months. On November 29, 2017, I advised the Minister of my decision to refer all Agent Orange applications back to him for further consideration per subsection 85(1)(b) of the Pension Act and 86(b) of the Canadian Forces Members and Veterans Re-establishment and Compensation Act. This decision was brought about as a result of a number of Federal Court decisions. These decisions, when reviewed as a body of law, have made clear that the Department and the Board have been incorrectly evaluating Dr. Dennis Furlong’s Fact Finders’ Report when adjudicating Agent Orange exposure claims. The Court’s conclusions led the Board to determine that Veterans in these cases have suffered a substantial breach of procedural fairness. It is for this reason that it has been decided to refer such cases back to the Minister. This will ensure that all Veterans with an Agent Orange claim receive a first-level decision based upon the law as it has been interpreted by the Federal Court, and will fulfill the Board’s obligation of procedural fairness to the Veterans that come before it. To read the letter I sent to the Minister and for more information, please visit http://www.vrab-tacra.gc.ca/Documents/Agent-Orange-eng.cfm. The Board is currently undergoing an internal reorganization which will improve the way we do business and allow us to better serve Veterans and their families. Our new organization better supports and aligns with changes brought about by technology and our move to a paperless process. At the end of the day, we will be working more efficiently, allowing us to spend more time producing quality decisions, and less time handing-off and mailing documents. Our target date for full implementation is March 31, 2018. We have made great progress on implementing our paperless hearing process. Most aspects of the paperless process have already been implemented for Review Hearings and we are evaluating recent pilots conducted for Appeal Hearings. Almost all Board members are now operating with a paperless system. We have more work to do in final quarter of this fiscal year, and anticipate that the paperless will be fully implemented by March 31, 2018. As you know, this summer we welcomed seven new appointments and six reappointments flowing from the new Governor in Council appointment process. Our new Members completed their training this fall and began hearing cases across the country. The Privy Council Office is currently running another Member Selection Process on behalf of the Board. We are looking forward to more Member appointments in the New Year. Additionally, processes are ongoing for the positions of Chairperson and Deputy Chairperson. As always, if you have any questions or concerns about the Board, please don’t hesitate to contact me. Please share this update with your members and encourage them to follow us on Twitter for information about the Board’s activities. OTTAWA, Jan. 5, 2018 /CNW/ - The National Council of Veteran Associations (NCVA) and The War Amps of Canadacontend that Minister O'Regan's announcement regarding the long-awaited "lifelong pension" has failed to live up to the Liberal government's election commitment to address the inequities in the New Veterans Charter, and continues to ignore "the elephant in the room" which has overshadowed this discussion. A new Additional Pain and Suffering Benefit would be created to essentially replace the Career Impact Allowance (Permanent Impairment Allowance) under the current Charter, with similar grade levels and monthly payments which would reflect a non-taxable non-economic benefit but limited in its application to those veterans suffering a "…permanent and severe impairment which is creating a barrier to re-establishment in life after service." A new, consolidated Income Replacement Benefit (IRB), which is taxable, would combine four pre-existing benefits (Earnings Loss Benefit, Extended Earnings Loss Benefit, Supplementary Retirement Benefit, and Retirement Income Security Benefit) with a proviso that the IRB would be increased by one percent every year until the veteran reaches what would have been 20 years of service or age 60, and that any veteran who wishes to join the work force may also earn up to $20,000 from employment before any reduction will be made to their IRB payment. It is not without financial significance that the current Career Impact Allowance and Career Impact Allowance Supplement have been eliminated from the Income Replacement Benefit package. Brian Forbes, Executive Chairman of The War Amps and Chairman of NCVA, stated that: "Although, as per usual, the devil remains in the details as to the applicability of these new provisions to individual veterans, it is relatively clear that certain seriously disabled veterans and their survivors will benefit from the Minister's announcement in that they may qualify for enhanced levels of compensation pursuant to the new benefits proposed for the New Veterans Charter. However, the greater majority of disabled veterans will not be materially impacted by the Minister's announcement in that the new benefits under the proposed legislative amendments will have limited applicability – thus the financial disparity between the Pension Act and the New Veterans Charter will continue for this significant cohort of disabled veterans in Canada." "Unfortunately, the Minister's announcement perpetuates a result where the greater majority of veterans under the New Veterans Charter receive far less lifelong compensation than a veteran pursuant to the Pension Act with the same disability," stated Forbes. Ensuring that no veteran under the New Veterans Charter receives less compensation than a veteran under the Pension Act with the same disability or incapacity, in accordance with the "one veteran – one standard" principle. "It is totally unacceptable that we continue to have veterans' legislation in Canada which provides a significantly higher level of compensation to a veteran who was injured prior to 2006 (date of the enactment of the New Veterans Charter) when compared to a veteran who was injured post-2006. If applied to the Afghan conflict, we have veterans in the same war with totally different pension benefit results," said Mr. Forbes. The 2017 Federal Budget clearly stressed wellness and rehabilitation principles with the government effectively "kicking the can down the road" in its promise of action on re-establishing a lifelong pension for veterans under the Charter by the end of the year. In this context NCVA/WAC recognizes the value and importance of wellness and rehabilitation policies, however, takes the position that financial security remains a fundamental necessity to the successful implementation of any wellness or rehabilitation program. It is readily apparent that this is not a choice between "wellness" and financial compensation as advanced by Veterans Affairs Canada but a combined requirement to any optimal reestablishment approach to medically released veterans. During the course of discussions following Budget 2017 leading up to the Minister's announcement, there was considerable concern in the veterans' community that the government would simply establish an option wherein the lump sum payment (Disability Award) would be apportioned or reworked over the life of the veteran for the purposes of creating a "lifetime pension" as ostensibly required under the Mandate Letter. NCVA and other veteran stakeholders strongly criticized this proposition as being totally inadequate and not providing the lifetime financial security which was envisaged by the veterans' community. Forbes stated that "…it is fair to say that the reasonable expectation of veteran stakeholders was that some form of substantive benefit stream needed to be established which would address the financial disparity between the benefits received under the Pension Act and the NVC for all individually disabled veterans." "It has been our recommendation to the Minister and the department that Veterans Affairs Canada should pivot completely from this lump sum payment evaluation for delivering the so-called lifetime pension option and instead look to the major conclusions of the NCVA Legislative Program and the Ministerial Policy Advisory Group report – both of these reports proposed that the combination of the best provisions of the Pension Act and the best provisions of the NVC would produce this form of lifetime pension in a much more realistic manner in order to ensure the financial security for those veterans who need this form of monetary support through their lifetime." The Policy Advisory Group report concluded that "…the enhancement of the Earnings Loss Benefit/Career Impact Allowance as a single stream of income for life, the addition of Exceptional Incapacity Allowance, Attendance Allowance, and a new monthly family benefit for life will ensure all veterans receive the care and support they deserve when they need it and through their lifetime." "It is noteworthy that the Policy Advisory Group report emphasized that an enhanced Career Impact Allowance would be a key ingredient to New Veterans Charter reform in that a newly structured Career Impact Allowance should reflect the following standard of compensation: '…what would the veteran have earned in his or her military career had the veteran not been injured?' This form of progressive income model, which would be unique to the New Veterans Charter, would have bolstered the potential lifetime compensation of a disabled veteran as to his or her projected lost career earnings as opposed to the nominal 1% increase proposed by the Minister," Forbes stated. He added that "this overall proposal would effectively bridge the best parts of the Pension Act and the NVC and represents a good first step to addressing the self-evident disparity between the NVC and the PA insofar as compensation is concerned, and provides a form of 'lifelong pension' for those veterans who qualified for the benefit proposed in the model." Upon the election of the Liberal government in 2015, it was the fundamental expectation of the veterans' community that this inequity would be rectified based on specific promises made by Prime Minister Justin Trudeau during the election campaign to re-establish a "lifelong pension" and in accordance with the formal commitment contained in the Mandate Letter from the Prime Minister to the former Minister of Veterans Affairs Kent Hehr in the Fall of 2015. Following the Minister's announcement, Forbes stated "veterans have lost faith that the government will fulfill its commitment and eliminate the two distinct classes of benefits available to disabled Canadian Armed Forces members." "There is no reason that the federal government could not have implemented the recommendations made by veteran stakeholders and Ministerial advisory groups who have been advocating specific proposals for a number of years to address self-evident gaps and inequities in the New Veterans Charter," Mr. Forbes added. "If the 'one veteran – one standard' philosophy advocated by Veterans Affairs Canada has any meaning, this glaring disparity between the Pension Act and New Veterans Charter benefits for the greater majority of disabled veterans required that the Minister seize the moment and satisfy the financial needs of Canadian veterans and their dependants," Mr. Forbes said. "The Minister has missed an opportunity to recognize that the longstanding social covenant between the Canadian people and the veterans' community demands nothing less." 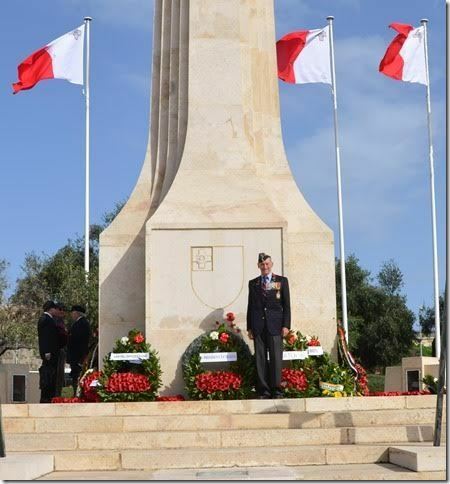 NVOC Memeber Malta, Remembrance Day Nov.12, 2017 RCAF Flight Lieutenant (ret’d) George E. Mayer, CD and Bar at the Malta Remembrance Day, November 12, 2017.